Cuban-born Gabriel Buigas’s childhood goal was to become a general manager of a baseball team, and though his path led him to a career in law, the idea of building a talented team, developing it, and retaining it, followed him all the way from Harvard Law School to his current position as vice president and deputy general counsel at the Hewlett-Packard (HP) Company. Buigas talks to HE about making innovative plays with one of the top legal teams in the industry. You’ve been at Hewlett-Packard for 15 years and held five positions. Tell me a bit about your role as vice president and deputy general counsel. Basically, I support our global business units, which include printing and imaging, the personal systems group, enterprise business, as well as our global supply chain. I report directly to our EVP [executive vice president] and GC [general counsel] Mike Holston and, in total, I oversee a staff of over 80 attorneys and other legal professionals. What are some of the projects you’re involved in? Part of my job is leading the efforts to simplify our contracting processes with our customers. I’m also very actively involved in developing our use of legal processing and service providers. These service providers are becoming increasingly important in how we effectively and efficiently provide legal services to our HP clients. What skills have allowed you to get to where you are today? The days that in-house practice was a cushier version of practicing law compared to a law firm are long gone. I worked hard and was willing to really learn the business to be successful in-house. Finally, we live in an increasingly global world so being both comfortable and sensitive to different cultures and business environments has been critical to my career. I’m sure your Cuban heritage has contributed to your global sensitivity. What else has played a part? Growing up in a bicultural environment, working with Latin America, and living in Tokyo and Spain have all given me a very good perspective on different ways of doing things, as well as the chance to understand issues from different perspectives. I’ve become an effective problem solver, whether the issue is in the US, China, or Brazil. What have your various roles at HP taught you? My initial role at HP forced me to really learn the company and its myriad of businesses. It gave me a strong systemic view of the company and it taught me to be a pragmatic problem solver. As a manager, I quickly learned that you were only as good as the teams you’ve built, so I have always spent a lot of time on ensuring we hired great talent and gave them room to shine. We spend a lot of time at HP on this topic and on ensuring we have the best legal team in the industry. You mentioned before that you’ve lived in Tokyo and Spain. How has your ability to relocate helped your career? I have always been willing to move for significant career opportunities; I’ve moved three times for HP alone. Lawyers are often very adverse to risk and are not always willing to explore new subject areas or new locations. Being willing to do so gives you a leg up on the competition. What has been a highlight of your career? HP gave me a great platform to introduce innovation in the delivery of legal services. We have really taken the use of legal processing and legal-services outsourcing at HP to another level and are seeing great results. It has taken a lot of effort to get where we are and a lot of change in management along the way. People now really see the value within the legal department and that has been great to experience. What advice would you give other Hispanics looking to get into your field? Get a great foundation by working with a law firm, corporate-legal department or government entity that will provide you with the foundational skills you need to succeed. You then need to have a real desire to understand the company and industry you will be providing legal services for, whether as an outside counsel or other legal-services provider, or as an in-house attorney, and, of course, be willing to work hard once you are there. 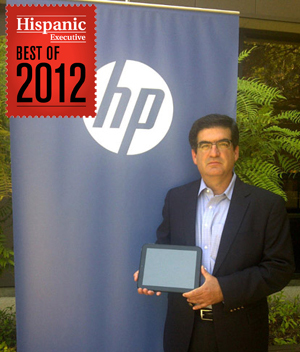 Get to know all of Hispanic Executive‘s “Best Of 2012” Recipients here.